Donations are central to our survival and we are deeply grateful for your interest in supporting our work and our guests, thank you. To make your gift by PayPal or credit card, complete the secure online giving process provided by PayPal.com. You can make a one time or a set up a recurring donation. We also accept donations by check (with checks, all donations are deposited and no fees are incurred). 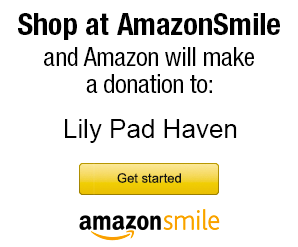 Lily Pad Haven, Inc. is a a non-profit 501(c)(3) organization. Your donations are tax-deductible. We often need specific household items or professional services such as dental or vision care and beauty services. Contact us for a list of current items you or your organization may provide.